Well, at least Snyder will get his name in the Guinness book of records. I mean, causing two nuclear explosions in one afternoon has to be some sort of record. 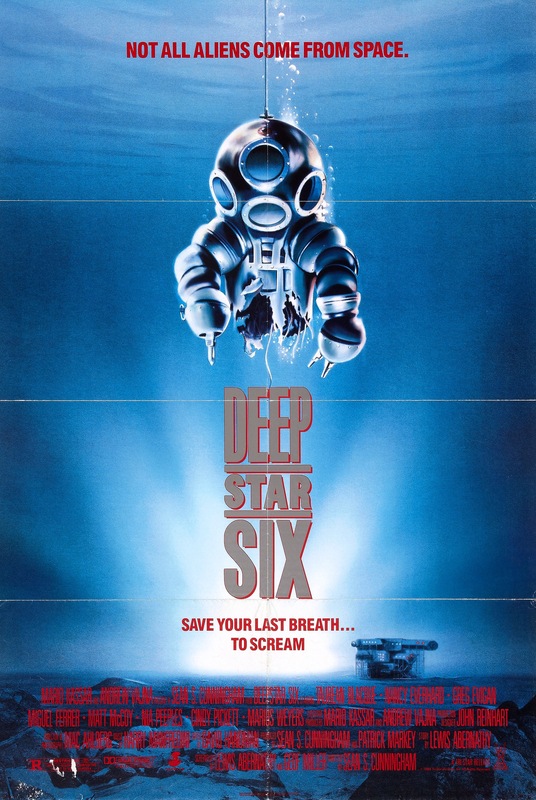 DeepStar Six has the distinct honor of being the first “terror from the deep” film to reach the 1989 box office — making Leviathan, The Evil Below, The Rift and The Abyss nothing more than simpleminded pretenders to the throne… of first into the water. DeepStar Six is the jerk kid that yells, “Last one in the water’s a rotten egg!” as he’s already jumping into the lake. In its rush to grace theater screens, DeepStar Six forgot a few key elements of narrative film. Namely script… and characters… and originality. The dialogue’s trash, and producer/director Sean S. Cunningham (Friday the 13th, House) cast so many of “that guy” and “that girl” in supporting roles that he forgot to cast charismatic leads. While amiable and easy on the eyes, Greg Evigan and Nancy Everhard would be a good choice to carry a CBS drama that’s cancelled after 13 episodes. DeepStar Six arrived early to the party, but that doesn’t do anyone any favors in 2019. There would have been a splash of novelty in January of 1989 — but from our perspective, Cunningham’s underwater thriller feels like bilious regurgitation. An experimental U.S. Navy deep sea laboratory surveys the ocean shelf, researching the potential for underwater colonization methods and installing a nuclear missile storage platform. The 11 crew members have one week left on their tour of duty when they discover a massive system of caverns beneath the planned site. Crotchety project manager (Marius Weyers) wants the cavern detonated and filled in order to proceed on schedule. Wide-eyed scientist (Nia Peeples) wants to study the potentially untouched ecosystem inside. The detonation causes a massive fissure in the ocean floor, unleashing a beast from the deep who consumes and torments the DeepStar Six residents (notable among them: Taurean Blacque, Miguel Ferrer, Matt McCoy, Cindy Pickett). Aside from playing “Let’s Remember From Where We Know That Actor Without Using Our Phones,” DeepStar Six gives movie fans reason to queue it up. If we write off the film’s turpitudinous screenplay (which does indeed torment unnecessarily) as a sunk cost, practical effects fans will enjoy the budget-conscious model work and creature effects. Cunningham attempted to spin his success with Friday the 13th into a similarly-styled underwater slasher film. Low budget thrills and water-based filming, however, generally make unpleasant bedfellows. The suspense elements just don’t work — largely because we’re not given reason to care about these people. In a masterful thriller like Jaws, Spielberg manages to hide the shark as much as possible while achieving maximum bang for a relatively minor buck. Even the most cursory search uncovers stories about how Spielberg maintained the illusion of reality despite repeated shark failures. DeepStar Six, due to its lack of mastery, telegraphs its shortcomings. Notable absence and notable success show like neon seams binding the special effects to the rest of the film. There’s an old mantra that you learn more about the creative arts by studying bad examples than you do good ones. I believe this to be 100% true, but you have to study the good ones first to recognize the how/when something fails. Jaws works so beautifully as suspense that the film never severs the viewer connection to the screen. You’ll never know what didn’t quite work. No punches pulled, DeepStar Six doesn’t work. It doesn’t have the actors to sell the illusion and it doesn’t have the money to distract from the acting with glorious effects. It does, however, showcase how Cunningham went about hiding the creature until absolutely necessary. He used sound and shadow and restraint to maximize an $8million budget, and I know some big budget filmmakers who could take a few of these tips to heart. 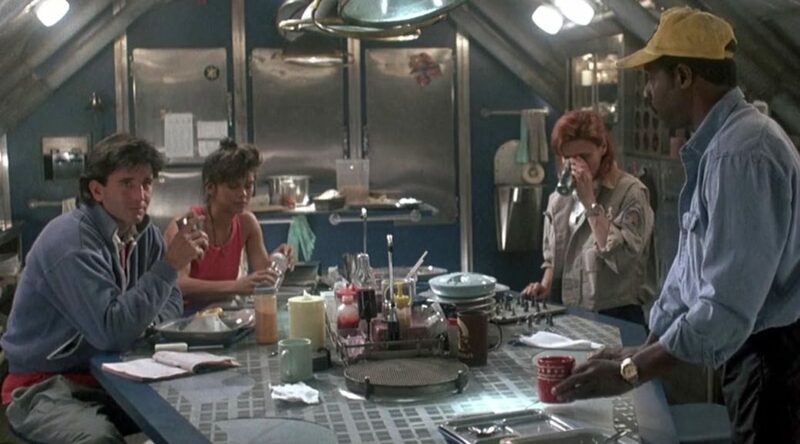 A few of DeepStar Six‘s dollars should have been reallocated to script development. That would have been the wisest of all uses. DeepStar Six is available to view on Amazon Prime Streaming. James David Patrick is a writer. He’s written just about everything at some point or another. Add whatever this is to that list. Follow his blog at www.thirtyhertzrumble.com and find him on Twitter, Instagram, and Facebook. I don’t know what’s worse: getting blown up in nuclear war or having a 7-11 on every corner. In my effort to watch movies from 1989 (because 30th anniversary) that I missed the first time around, I rattled the streaming services to see what shook down. 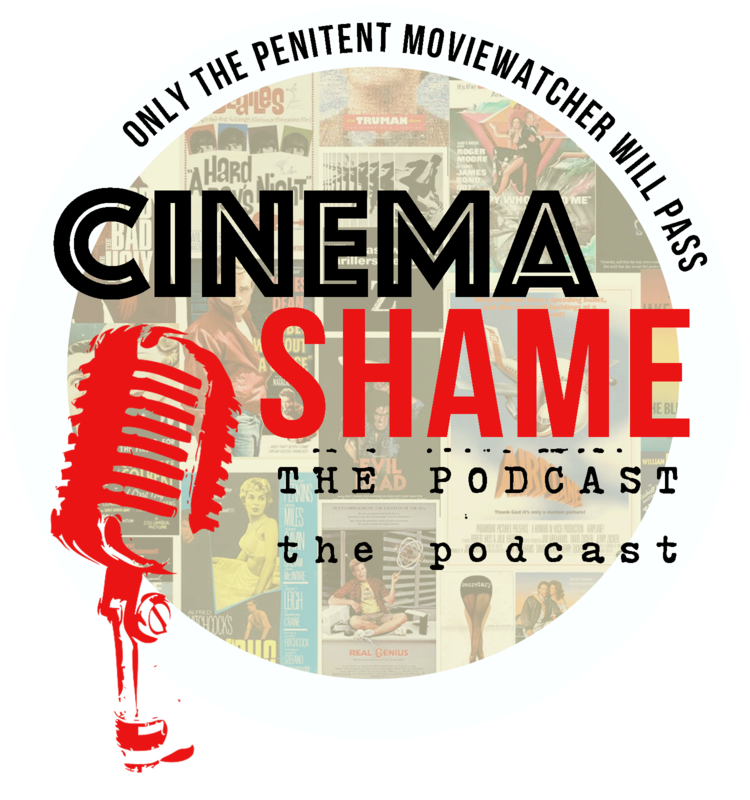 Not to steal the 80s All Over podcast thunder — but I definitely don’t plan to watch everything from 1989. They’re doing the heavy lifting, I’m just doing a couple squats and calling it a day. I have a weakness for 80’s counterculture movies and Christian Slater; therefore, it’s inexplicable that I’d never sat down with Gleaming the Cube until now. 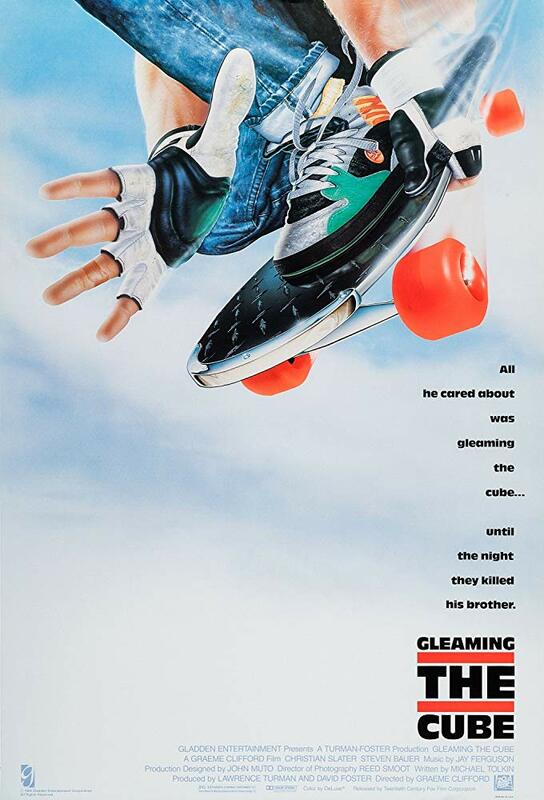 Released on January 13th, 1989 in 469 theaters at a time when everyone was watching Rain Man and any other movie might as well just bugger off — Gleaming the Cube made only $2.7million at the box office. It gained more life on home video and cable replays on USA Network and has become a cultural touchstone for young skaters everywhere. References to the film have appeared in The Simpsons, Robot Chicken, South Park, The Goldbergs, The Lego Batman Movie and even the new Netflix Voltron series. Christian Slater plays Brian Kelly, a 16-year-old skateboarder who takes it upon himself to investigate the death of his adopted Vietnamese brother after the police rule his death a suicide. Brian and his anti-establishment skater friends take down Cali-based international arms dealers by being punk as hell and now kowtowing to the man. And that’s all you really need to know. Brian falls for a girl, gets dismissed for being a social misfit, and ultimately proves that despite his outward IDGAF appearance, he’s not the zero that everyone thinks. While the narrative feels trite and advances predictably, there’s a well-intentioned heart to the film that embraces the social consequences of being anti-establishment. 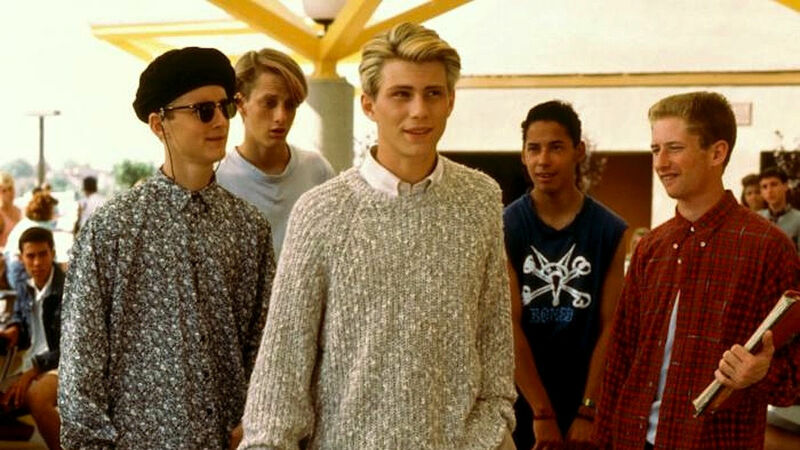 I don’t want to oversell the film’s profundities, but Gleaming the Cube masks a certain amount of intelligence behind its caricature-laden and simpleminded facade — perfectly paralleling the plight of its main character. I don’t know if director Graeme Clifford had such ambitions in mind for this teen drama, but I also can’t immediately discount him as someone who stumbled into relative creative success. Frances, his first feature, garnered Academy Award nominations for Lead Actress (Jessica Lang) and Supporting Actress (Kim Stanley). The biopic of Frances Farmer immediately preceded a couple episodes of Shelley Duvall’s Faerie Tale Theatre. After Gleaming the Cube? A wasteland of Kirstie Alley and made-for-TV movies. Kinda dumb, but dumb in a way that seems to be intentionally masking some intentioned ideas about counter/teen culture. The bevy of talented skaters/stuntmen include Tony Hawk and Mike McGill and even though I don’t follow skating I’m familiar with these two titans of the sport. As a result the skating scenes aren’t just cursory exercises — they’re carefully plotted and performed. There’s a reason Gleaming the Cube continues to inspire skateboarders in 2019. You can’t deny the charisma of late 80’s/early 90’s Christian Slater. He’s a potent screen presence because he rides a line between a little bit dangerous and totally relatable. 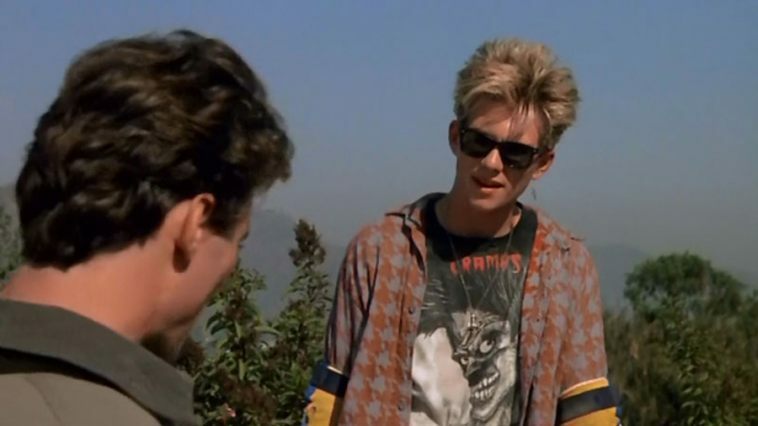 Although he’d already appeared in some prestige movies like The Name of the Rose and Tucker: A Man and His Dream, Gleaming the Cube gave Slater a chance to be his own thing — a thing that he would perfect later on in 1989 in Heathers and Pump Up the Volume (1990). Gleaming the Cube is available on Amazon Prime Streaming. Unfortunately there’s no Blu-ray or HD version available. Joan Wilder: You’re the best time I’ve ever had. Jack Colton: I’ve never been anybody’s best time. Romance novelist fish-out-of-waters through the Columbian wilds as she attempts to ransom her sister from smalltime schemesters by delivering the map to a jewel called El Corazon, meets Indiana Jungle Jones and winds up afoul of not only the schemesters but a faction of the Colombian army — all hell bent on taking the jewel for themselves. 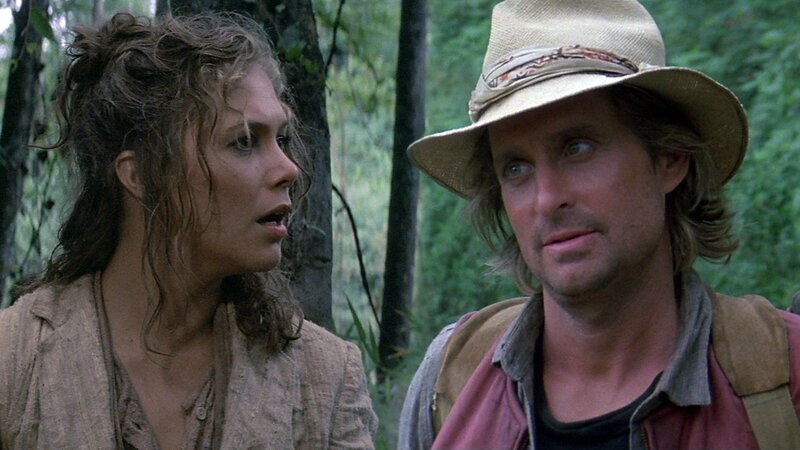 Few movies sew those nostalgic oats quite like Romancing the Stone. The movie implanted one of my earliest moviegoing memories that didn’t involve Star Wars. Robert Zemeckis’ 1984 adventurer wasn’t my very first theatrical live action film experience, it often feels like it. An early moment in the film indirectly reminds me what it was like to be six years old and staring up at the big screen in wonder. Jack grows tired of Kathleen Turner’s romance novelist hobbling around the South American jungle. He takes his machete and chops the heels off her shoes. Joan Wilder: Those were Italian. Jack Colton: Now they’re practical. What did I know about women’s shoes? Not a thing. I probably wore velcro Kangaroos with the little pockets to the theater. Still, 6yo me marked that down as hilarious. I remember using that “Those were Italian!” line in many different circumstances. I might accidentally break something and exclaim “Those were Italian!” like a catch-all expletive. You get the picture. I never succeeded in making “Those were Italian!” my own personal catchphrase, but the scene itself acts as a time capsule. I’m instantly granted the gift a piece of me as I was in 1984. Nostalgia’s a wonderful thing in moderation. We can never go home again, but cinematic moments like these, the ones we latch onto for whatever reason, grant us a fleeting reprieve from the bustle of adulthood. After reading Kathleen Turner’s nuclear interview by David Marchese of Vulture, my wife and I began winding through Turner’s filmography. I started with a first-time viewing of The War of the Roses (1988) and then returned to the beginning of the Douglas/Turner/DeVito era with a Romancing the Stone refresher. Over the years, Stone has become comfort food for this 80’s soul. Unfortunately it seems that younger viewers don’t appreciate the simplicity of Stone‘s form and function. My observations come purely from casual browsing of Letterboxd.com, so please don’t @ me with demographic studies that show most women aged 18-25 rate Romancing the Stone four stars or higher (unless of course those demographic studies support my remedial investigation). Turner just goes for it. In every film. That was never more apparent than in The War of the Roses where she gives an absolutely savage performance. 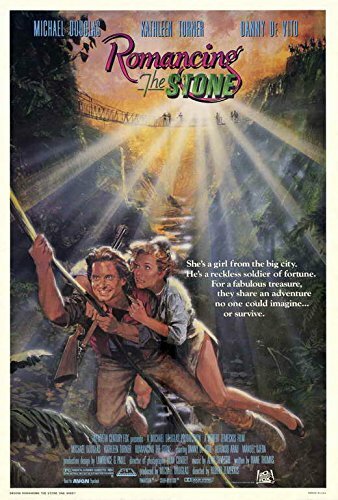 I’ve always felt that Romancing the Stone was a Michael Douglas movie — the charmer, the expat vigilante treasure hunter. I had it all wrong. Turner’s romance novelist makes the journey from a fainting woman of words to an action hero. Without Turner’s commitment to both sides of Joan Wilder, the scripted character could have remained nothing more than a distressed damsel. She made more of the character than was on the page. While Romancing the Stone proffers a style of entertainment rooted in the trends of the 1980’s, it also recalls screwball films and swashbuckling action/adventurers of the 1930’s. Michael Douglas’ Jack Colton character might be a less studious Indiana Jones, but he’s, at heart, an amalgamation of many matinee idols. Gary Cooper or Johnny Weissmuller without the patina of glossy perfection. And it’s hardly a stretch to imagine Cary Grant and Katherine Hepburn as Jack Colton and Joan Wilder slashing through a soundstage populated by ferns and palms and verbal barbs. Take Cary Grant and Katherine Hepburn in The Philadelphia Story and just add jungle. The Grant/Hepburn substitution feels natural. Robert Zemeckis directed Romancing the Stone with the pretense of propping up the charisma of his stars as the main attraction, a decidedly old school filmmaking methodology. 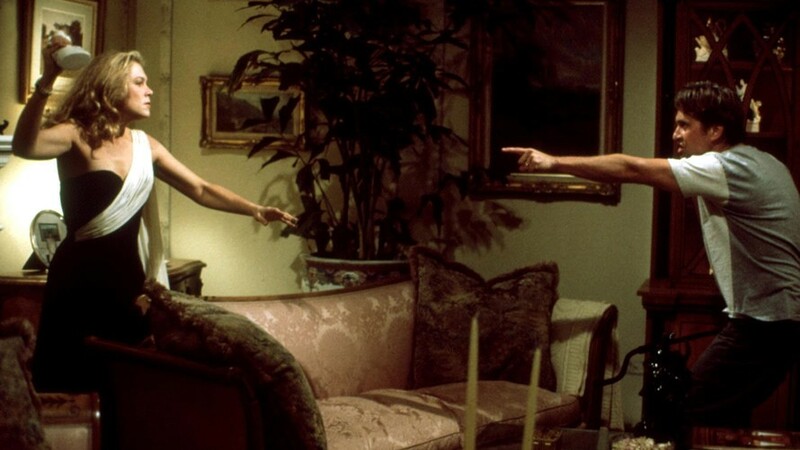 Stone sells the pretense of action and stuntwork, but the focus remains small and the danger never feels entirely real (owing to the cartoonish pursuit by the hyperbolic DeVito) and his megalomaniacal-ish cousin Ira (Zack Norman). Though the stunts occur in regular beats, none of them take the form of a centerpiece — except perhaps the escape from Juan’s compound. Even that, however, stands out as a result of the comedic talents of the great character actor Alfonso Arau. It’s entirely understandable hen someone says that Romancing the Stone didn’t live up to their expectations. Stone retains its status as a certified 80s classic. As a result viewers’ expectations likely skew bigger and broader. Raiders of the Lost Ark, the standard-bearer for 1980’s adventure cinema, casts a long shadow over other similar films of the era. Best known for the Back to the Future films, Robert Zemeckis makes character-driven narratives within the modern iteration of the Hollywood dream machine. At its most basic component, behind the flash and spectacle of a time-traveling DeLorean, Back to the Future, like Romancing the Stone, is high concept narrative buoyed by the establishment and development of character. I’ll forgive first-time viewers that didn’t have their expectations met, but I’ll also suggest they go back for a second ride once their initial disappointment has evaporated. Focus on the interplay between Douglas and Turner. Focus on how their screwball banter and evolves beyond the idol worship of shadowy matinee man of action and romance. Consider how Romancing the Stone and Douglas then undermine the notion of the soft-focus man meat that inhabits Joan Wilder’s romance novels. If all else fails, just give it another chance to appreciate Hollywood’s discovery of Kathleen Turner, superstar. She’s the real gem here, not the costume jewelry macguffin Joan and Jack rescue from a cave. On the next episode of 80’s Flashback, I’ll exorcise some demons and discuss my disappointment with The Jewel of the Nile.